With thanks to CSIRO Science by Email. Scientists have discovered a new Australian dinosaur, and it’s a big one! Several giant bones, some over one metre long, were uncovered near the town of Winton in central Queensland. But what’s got scientists all worked up isn’t what it looks like: it’s where it came from. Scientists have named the new dinosaur Savannasaurus elliottorum. It was a big, four-legged plant eater, and looked a bit like a brontosaurus. Savannasaurus was as tall as a giraffe, but much heavier. Fossils from big plant-eating dinosaurs can be found in many places around the world. Some are up to 150 million years old! Several different species are found in Australia, but they only date back to 100 million years ago. Scientists think that these Australian dinos, including Savannasaurus, might be recent arrivals from another continent. Their best guess is that Savannasaurus came from South America. So how did Savannasaurus get to Australia? They probably walked! During the time of the dinosaurs, the world was a very different place. South America and Australia were both much closer to Antarctica. And that means there may have been dry land linking the three continents. The world of the dinosaurs was also a lot warmer than today. Antarctica was covered in trees, not ice. Up to around 100 million years ago, it was still pretty cold, but then global warming kicked in. A warmer world might have allowed Savannasaurus to migrate to Australia, along with other large dinosaurs. We still have plenty to learn from Savannasaurus. We don’t know how far it spread, or how long it lived until it became extinct. Even the story of how it got here is just a best guess. But it’s pretty cool imagining Australia 100 million years ago, filled with giant dinosaurs! There’s been some success. Extremely tiny shapes, similar to those found in a moth’s eye, have been made using metals, silicon and plastics. Scientists at the University of California, Irvine, recently described how to etch a pattern of nano-sized cones on Teflon, the non-stick material famously found on frying pans. After coating a thin film of Teflon with a layer of tiny polystyrene balls, they exposed it to a corrosive chemical. The polystyrene partially protected the Teflon, leaving millions of tiny nanocones etched into the surface. In the process, the Teflon film turned from transparent to white, a sign that light was being scattered. Then they added a thin layer of gold to the cones. To their surprise and, at first, concern, they noticed what looked like soot had appeared on the surface. 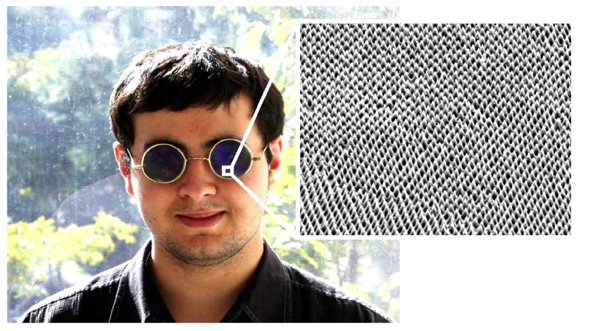 In fact, the material had turned black and was antireflective, bouncing less than one per cent of incoming light. As well as reducing glare, the aptly named black gold also conducts electricity and repels water. It seems the magnificent moth eye has much to teach us. Ghost nets are fishing nets that have been lost or abandoned at sea. 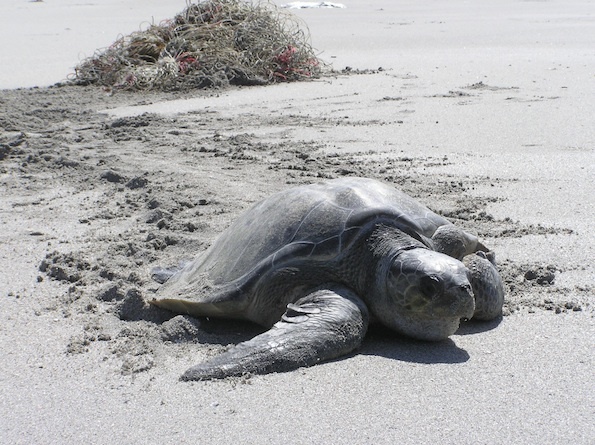 These nets continue to travel through the ocean, trapping and entangling turtles. These nets are very hard to escape from and can drift in the ocean for decades, catching protected turtles and other marine species. Scientists from CSIRO are working with GhostNets Australia and Indigenous rangers to identify areas where turtles are most at risk. The researchers use models based on ocean currents to identify areas that are likely to have a high number of ghost nets in the Gulf of Carpentaria and to find out where turtles are most likely to get caught up in these nets. The team is also working with schools and citizen scientists to survey beaches for litter. The data will help them identify where efforts to clean up nets and marine debris will have the greatest impact. CSIRO’s Dr Denise Hardesty is leading the research and says, “The best way to tackle marine debris is to stop it from entering our oceans. Together we can all make a difference.” Simple things such as recycling and picking up litter can go a long way in protecting the future of marine turtles! An exploding star is called a supernova. 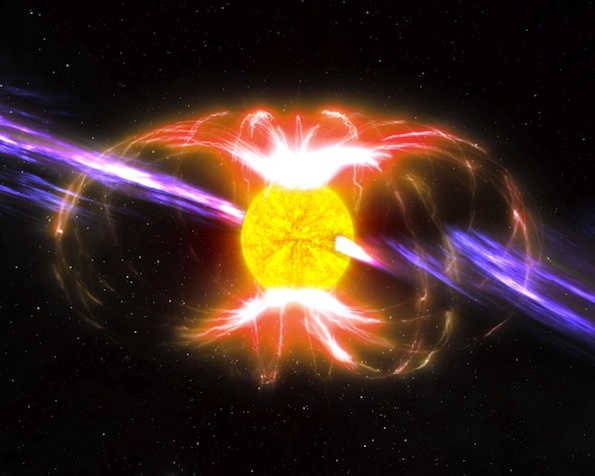 The big blast can leave behind a pulsar, which is a kind of neutron star. A pulsar spins very fast and sends energy to Earth, in the form of radio waves. As the pulsar beam passes repeatedly over the Earth, like the spotlight of a lighthouse, the pulsar appears to be blinking. A pulsar is sometimes known as the ‘clock’ of the universe. Just as the Earth spins on its axis every 24 hours, a pulsar spins at a constant speed. Scientists measure the speed of a pulsar by how often Earth receives a ‘pulse’ of radio waves. With the help of CSIRO’s Parkes telescope, and another telescope in South Africa, a group of researchers noticed that one pulsar was spinning slower than usual. The pulsar is located in the constellation of Puppis and is estimated to be 37 000 light-years from Earth. One possible explanation for the decrease in speed is that a large rocky object – such as an asteroid – hit the pulsar. Scientists estimate that the asteroid weighed a billion tonnes and could have been created when the star exploded! CSIRO’s Dr Ryan Shannon suggests that the pulsar may have reacted to the collision by zapping the asteroid, causing it to vaporise. The vaporised particles that are left behind are electrically charged. These particles cause the pulsar to spin more slowly, changing the shape of the radio waves received by Earth. It has been said that time heals all wounds. The ‘clock’ of the universe is expected to return to its original spinning speed once those pesky particles pass! Just as plants grow and develop, so does technology. The combination of these two fields has given rise to ‘nanobionics’. This exciting field could lead to pollution-free machines and a better understanding of our environment. Plants make their own food by photosynthesis, a process which takes place in tiny sub-units of cells called ‘chloroplasts’. A team of researchers from the Massachusetts Institute of Technology inserted nanoparticles into the chloroplasts of plants, boosting their ability to capture light energy. As well as supercharging photsosynthesis, the researchers discovered a second superpower – the treated plants glowed when exposed to infra-red light! The team also noticed that the glow stopped when the plant was exposed to nitric oxide – a pollutant commonly produced by cars. The plants acted as chemical sensors, the glow fading in response to the pollutant. Professor Michael Strano, lead researcher of the study, foresees wide application of bionic plants in our society. He hopes that nanoparticle technology will enable plants to produce energy for other functions – limited only by our imagination. While there is still more research to be done, our future looks brighter, safer and greener. 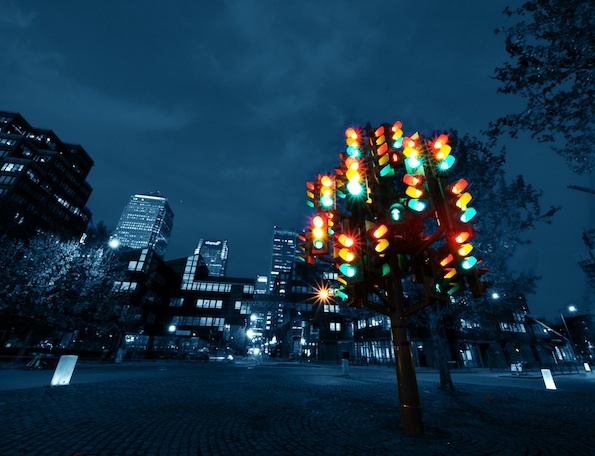 It won’t be long before bionic plants are lighting up our streets and monitoring our environment! Tough and rubbery, the drop had some interesting properties, but Steve didn’t think much of it until he talked to Tri Phan, a doctor working in the microscopy division at Sydney’s Garvan Institute of Medical Research. “He got excited,” says Steve. The lens simply sticks onto a smartphone camera to provide instant magnification. Steve is now talking to dermatologists who think this tiny lens could track suspicious moles in case they change shape. Farmers could use it to identify pests, perhaps uploading photos to biosecurity agencies. The lenses might find use in developing countries as they cost only a cent in material and all you need to make them is an oven. Steve says they are so easy to make you could do it at home. He suggested you could make one with gelatine by experimenting with different viscosities, and it works! See this week’s activity to make your own jelly lens and try sticking it on a smartphone. In the world of Harry Potter, lights, machines and even castles are controlled by a flick of the wrist. Forget wands and wizards, soon you too could control the world around you. Jake Coppinger, from Gungahlin College in Canberra, has designed a glove that could change the way we use technology – and it is as easy as lifting a finger. The glove, branded ‘Swirlesque’, allows a person to control technology from a distance. The master mitt can recognise hand gestures and control internet-connected devices such as computers, smart phones and music players. A small computer sewn into the glove – called a microcontroller – receives data from a motion sensor. The computer looks for specific patterns in the data. When it recognises a pattern, it sends instructions to the required device using wireless Bluetooth signals. Jake believes that while technology is becoming more powerful, keyboards, remotes, and other controllers have not changed much. The tech-savvy sixteen year old used his idea in a project for the CSIRO CREativity in Science and Technology (CREST) awards program. After spending 140 hours to design and program the glove, he won third place at the 2014 BHP Billiton Science and Engineering Awards. Jake hopes to develop his design further to make it smaller and more user friendly. He is looking forward to completing Year 11 and meeting like-minded people in his upcoming trip to the Intel International Science and Engineering Fair in California. Many water sources in India are heavily contaminated or impure. A number of diseases can be carried in the water, making it very unsafe to drink. Untreated sewage is one of the main sources of water pollution in India. Sewage seeps into rivers as there are not enough treatment facilities available. The build up of impurities in waterways can affect fish and food crops such as rice. People can become very sick from drinking water and eating food from polluted rivers. CSIRO’s Dr Anu Kumar travelled to India with a team of researchers to help scientists develop ways to control the effect of contaminants, including sewage and industrial chemicals, on the environment. As an extension of the project, she organised a field trip for a group of rural children to the Ganga Aquarium in Lucknow. The children learnt about fish diversity and the effects of water pollution on fish and the environment. They also learnt about keeping clean and investigated ways to conserve water. Students were encouraged to share their experiences with their families when they went home. To be called faceless or lacking a backbone is a bit insulting, however, it might now be time to face up to our simple origins. Scientists have known that jawed vertebrates evolved from ‘jaw-less’ ones, but just when and how it happened has remained a mystery until recently. A fossil fish discovery in China indicates that placoderms gave rise to all modern fishes and vertebrates, including us. Placoderms are an extinct group of armoured fish and are thought to be the first early vertebrates to develop a jaw. The fossil uncovered new clues that challenge the current theories about the origin of the vertebrate face. 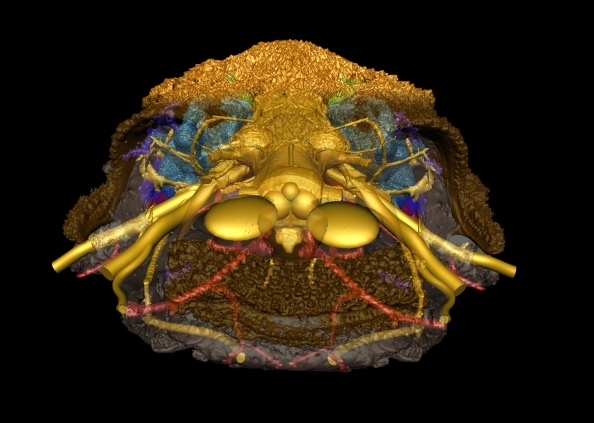 A team of French and Swedish researchers have built upon this discovery when they studied the skull of a fossilised Romundina – an ancient placoderm that lived over 400 million years ago. The researchers were able to trace the development from ‘jaw-less’ to jawed vertebrates with the help of high energy x-rays. The images show that the ancient fish developed two nostrils and a very big upper lip that extended in front of the nose. Over time, this upper lip disappeared and gave way to the nose. The forehead began to grow and the face lengthened. The arrangement of facial features in Romundina appears to be very similar to that of a human face – suggesting that our face hasn’t changed all that much over time! Fossil findings reveal fascinating results. This discovery shows that vertebrate evolution is a little fishy and we should dig deeper! Is it a fish? Is it a boat? No, it’s a robotic float – ready to dive deep and collect information about the ocean! The ocean covers more than 70% of the Earth’s surface and plays a big part in controlling global weather. The Indian Ocean is one of the main pathways by which warm water returns to the Northern hemisphere. It is also home to huge fisheries and mineral resources. Ocean-diving robots – known as Argo floats – have been plunging to the depths of the ocean to provide scientists with important data on underwater salinity and temperatures. Now, CSIRO scientists have teamed with leading marine scientists in India to take a closer look at the Indian Ocean climate and ecosystems. To do this, the team extended the robots’ capabilities – developing new ‘Bio Argo’ floats. These clever floats will collect data to help scientists understand what factors keep the Indian Ocean healthy. Over the next few years, dozens of floats will be released into the depths of the Indian Ocean. Tiny sensors on the floats measure a range of factors like ocean temperature, salinity, dissolved oxygen, nitrate, and dissolved organic material. The floats will also collect information on phytoplankton cells – underwater ‘plants’ that fuel the ocean food web. This data will ultimately help scientists better understand and predict how carbon dioxide is processed by the ocean and how much food the Indian Ocean can produce. The floats will free drift in the ocean from anywhere between the surface and 1000m depth, collecting data along the way. When each robot’s memory is full, it will emerge at the surface and send data to scientists via satellites. The floats will then dive back down into the ocean, continuing their mission for months or even years at a time. With a new set of senses, these underwater allies are ready to embark on an exciting mission. We wish them the best of luck with their journey and hope they have a whale of a time! Life has never been easy for penguins, and changing weather patterns are creating more challenges for some colonies. The coast of Argentina is home to the world’s largest breeding colony of Magellanic penguins. Scientists from the University of Washington have found that downy chicks are struggling to cope with increasing storm activity and rainfall in the region. Downy chicks haven’t yet developed waterproof feathers and are too big to snuggle under their parents for warmth. Without this protection, water can easily seep into their down – or immature feathers – during periods of heavy rainfall. The wet down makes chicks very cold and sometimes leads to death. Further south on Ross Island in the Antarctic, Adelie penguin survival depends on the form and amount of sea ice. Over recent years, sea ice in the Ross Sea has become less predictable with more ice in some years and less in others. An international team found that it is easier for Adelie penguins to forage when sea ice is low. When sea ice is high, penguins are restricted from accessing prime foraging areas. Starvation and exposure are real dangers for chicks as the adult penguins must leave the colony for longer foraging trips. While coping with change is a challenge for some penguins, researchers from the University of Minnesota discovered that some Adelie penguin colonies may actually benefit. With increasing temperatures, glaciers melt and retreat – opening up new nesting sites for some populations. Environmental change offers both challenges and opportunities for species, especially for those living in extreme climates. Scientific monitoring can help to ensure these seabirds continue to waddle on. 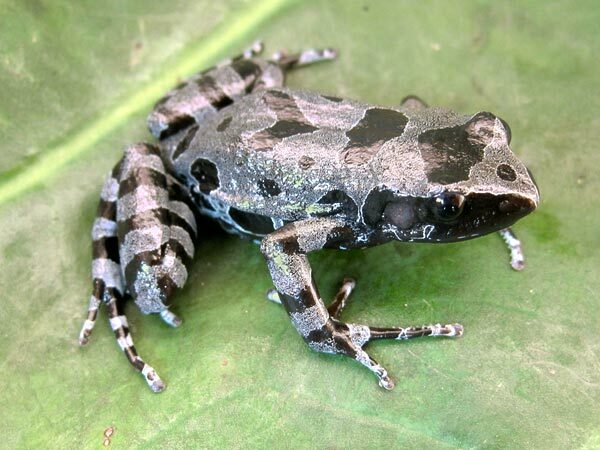 “Lost” Long-Fingered Frog Found in Africa.